Since Adam and Eve sinned by their selfish and prideful disobedience of their benevolent Creator's commandment, humanity had been ostracised from God's Presence. Where once our foreparents spoke to God "face to face" in the Garden of Eden, afterwards human beings could only approach the Divine Presence from a distance and with blood sacrifice. The prophets of the Old Testament and some kings and priests did personally experience God's Presence by the indwelling of the Holy Spirit. But the common person could only approach God indirectly by going to the Temple in Jerusalem to offer sacrifices. For there, in the Holy of Holies, God's Presence dwelt. But, no one could enter in there, except the High Priest (and he only once a year), or else they would be struck dead. But on the Day of Pentecost, fifty days after Resurrection of our Lord and Saviour Jesus Christ, the first part of Joel's prophecy (quoted above) was fulfilled. God poured His Spirit "on all flesh". It started first with the 120 believers in the upper room, as recorded in the Book of Acts, where it say, "When the Day of Pentecost had fully come, they were all with one accord in one place. And suddenly there came a sound from heaven, as of a rushing mighty wind, and it filled the whole house where they were sitting. Then there appeared to them divided tongues, as of fire, and one sat upon each of them. And they were all filled with the Holy Spirit and began to speak with other tongues, as the Spirit gave them utterance" (Acts 2:1-4). Later that day 3000 more people believed, were baptised, and received the gift of the Holy Spirit. Just what is the "gift of the Holy Spirit"? The Holy Spirit, you may remember, is the third person of the Holy Trinity, through whom the entire Godhead works with humanity. He is triunity: three equal persons, each one dwelling in the other two by virtue of an unceasing movement of mutual love". "There is distinction, but never separation. Father, Son and Spirit - so the saints affirm, following the testimony of Scripture - have only one will and not three, only one energy and not three. None of the three ever acts separately, apart from the other two. They are not three Gods, but one God". "Each of the three is fully and completely God. None is more or less God than the others".
" (John 7:37-39). Jesus also said, "I will pray the Father, and He will give you another Helper, that He may abide with you forever" (John 14:16). Christ promised the Holy Spirit would reveal truth to the Church. "When He, the Spirit of truth, has come, He will guide you into all truth; for He will not speak on His own authority, but whatever He hears He will speak; and He will tell you things to come. He will glorify Me, for He will take of what is Mine and declare it to you" (John 16:13-14). Jesus says the Holy Spirit will bring glory to Christ. This gives us an excellent means of testing whether or not acts attributed to the Holy Spirit are indeed valid. The last words of Christ before His Ascension include a promise: "John truly baptized with water, but you shall be baptized with the Holy Spirit not many days from now" (Acts 1:5). This word was fulfilled ten days later on the Day of Pentecost. The people who heard the Apostle Peter speak at Pentecost asked him how they might receive salvation. He answered, "Repent, and let every one of you be baptized in the name of Jesus Christ for the remission of sins; and you shall receive the gift of the Holy Spirit" (Acts 2:38). We repent (turn from our sins and toward Christ); we are baptized; and we are given "the gift of the Holy Spirit" through chrismation. That practice has never changed. All people, when they are baptized into the Church, are "sealed with the Holy Spirit of promise, who is the guarantee of our inheritance until the redemption of the purchased possession, to the praise of His glory" (Ephesians 1:13-14). The outpouring of the Holy Spirit was an evidence that the last times, the day of the Lord, had come. 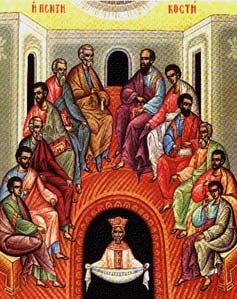 Hence, Pentecost was a proof to the Jews that Jesus indeed was the Messiah. And the outpouring of the Holy Spirit upon the Gentiles (Acts 10:44-48) was a proof they were equal to the Jews in this final age. The guarantee is a first installment, a down payment of what is later to be completed: we both are redeemed and shall be redeemed. Thus, having the Holy Spirit dwelling in us is proof that we will receive eternal life. The trick is not to grieve the Holy Spirit, by our sins, and cause Him to abandon us. How will we know if we have the seal of the Holy Spirit? By performing miracles or healings? By speaking in tongues? Or by being an apostle, or an evangelist, or a prophet? No. You could have one or more of these gifts but still grieve the Holy Spirit. It is by producing good fruit - "for the fruit of the Spirit is in all goodness, righteousness, and truth" (Ephesians 5:9). And, "the fruit of the Spirit is love, joy, peace, longsuffering, kindness, goodness, faithfulness, gentleness, self-control" (Galatians 5:22-23). "Love suffers long and is kind; love does not envy; love does not parade itself, is not puffed up; does not behave rudely, does not seek its own, is not provoked, thinks no evil; does not rejoice in iniquity, but rejoices in the truth; bears all things, believes all things, hopes all things, endures all things. Love never fails" (1 Cor. 13: 4-8). Gifts of the Spirit such as healing and prophesying, wonderful as they are, are temporary and incomplete. They are for this age, while we are "children". But love continues into the age to come: it is eternal, complete and fulfilling. We said previously that before Pentecost, humanity was barred from God's Presence. The Death, Resurrection and Ascension of our Lord and Saviour Jesus Christ changed all that. For God now lives in the heart of every believer. This is a great mystery! The Creator of the whole universe condescending to live in our mortal bodies! Both there and here He shows Himself to me with equal glory"
Likewise the Apostle Paul says, "Do you not know that you are the temple of God and that the Spirit of God dwells in you? If anyone defiles the temple of God, God will destroy him. For the temple of God is holy, which temple you are" (1 Cor. 3:16-17). I pray that we all live in repentance, faith and love. "Chase after love", as St. John Chrysostom urges us, and keep yourselves holy. For you are God's holy temple.